Fun, unusual details in menswear are somewhat of a rarity today. Fashion designers now experiment with awkward cuts and unflattering fits rather than having fun with smaller details that can set one’s suits apart from others. Inspired by the Edwardian Era fashions, designers and tailors in the 1960s and 1970s experimented with unique ways to have fun with clothes. The flapped breast pocket was one of these special Edwardian details that was popular on suit jackets and odd jackets in the 1960s and 1970s. The flapped breast pocket has long been a a part of on military dress, and many military uniform designs have flapped patch pockets on either side of the chest, matching the flapped patch pockets on the hips. A flapped patch breast pocket or a pair of flapped patch breast pockets was a popular detail on 1970s suit jackets and odd jackets. The set-in (cut into the cloth) flapped breast pocket that resembles a typical flapped hip pocket was also fashionable in the 1960s and 1970s. This unusual breast pocket style is not as formal as the usual welt breast pocket, just like flapped hip pockets are not as formal as the simpler jetted pockets style. The pocket flap is a sporty detail because it serves the utilitarian function of preventing items from falling out of a pocket. Pocket flaps have become standard on the hip pockets of suit jackets and odd jackets, but they never caught on for breast pockets. A flapped breast pocket can give a sporty flair to any suit jacket or odd jacket, though on suits it is best for the sporty variety like a bolder Prince of Wales check, gabardine or tweed. It’s a noticeable detail to people who are used to seeing suits with welt breast pockets, so the flapped breast pocket is best avoided for business suits. Though it’s never wrong on a suit, it can seem inappropriate on a pinstripe suit, especially if worn to the office. For a sports coat, a flapped breast pocket—or even two flapped breast pockets, one on either side—is always appropriate. A flapped breast pocket may be slanted slightly upwards like an ordinary welt breast pocket, or it may slanted downwards to match hacking hip pockets. Flapped breast pockets are bold, and if the flap is too deep, the pocket will make the jacket look top-heavy. Typically the flap should be the height of a ticket pocket’s flap, which is a little shorter than a normal hip pocket’s flap. 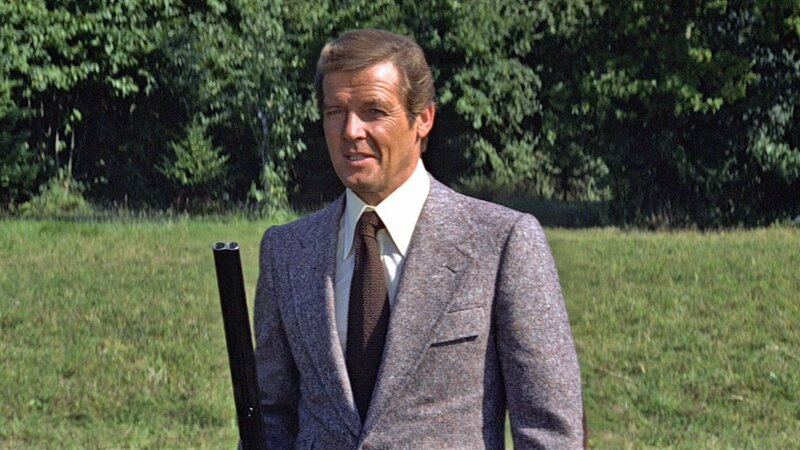 James Bond wears two jackets with flapped breast pockets in two Roger Moore films: The Spy Who Loved Me and Moonraker. 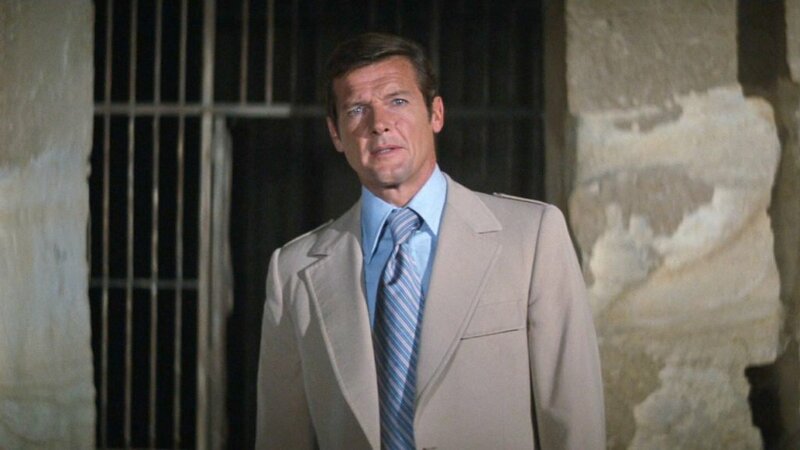 In The Spy Who Loved Me the flapped breast pocket is on a tan cotton safari sports coat made by Angelo Roma that Bond wears in Egypt. The flapped breast pocket builds upon the many other sporty details this jacket has. While the pockets on the hips are patch pockets with flaps, the breast pocket is set-in with a flap. Without putting two flapped patch pockets on the chest, the single set-in flapped pocket on the chest does not disrupt the balance in the way that one flapped patch pocket may. 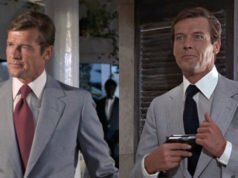 In Moonraker the flapped patch pocket is on a brown donegal tweed suit made by Angelo Roma that Bond wears for hunting. The hip pockets are slanted hacking-style pockets with flaps and include a ticket pocket. The breast pocket is angled upwards like an ordinary breast pocket, and the flap is the depth of the ticket pocket. 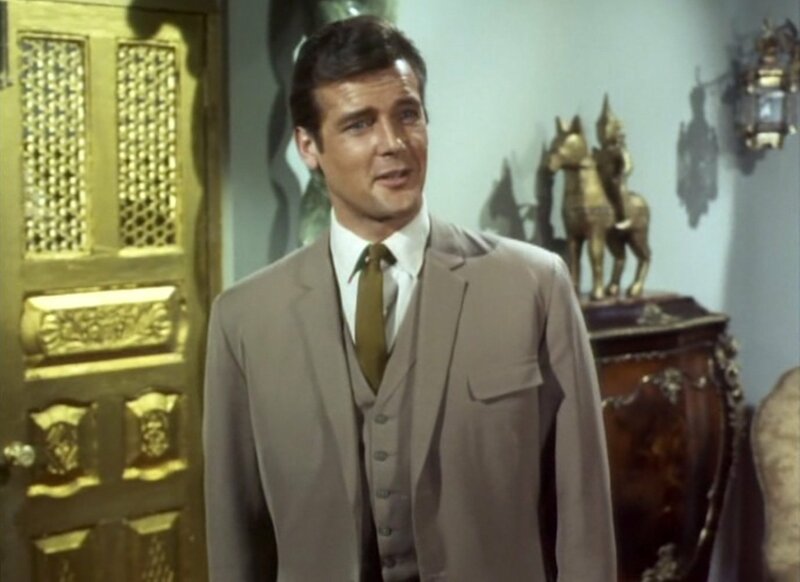 Simon Templar in The Saint in 1966 he wears a light brown three-piece suit with a flapped breast pocket that adds a sporty flavour to the suit, balancing the formality of the waistcoat. Also in 1966 he wears a fancy pleated-back sports coat that has two flapped breast pockets. Since there is no ticket pocket, the two flapped breast pockets gives the front an unusual symmetry. A welt breast pocket on either side may look odd, but with flaps the double-breast-pocket style is reminiscent of uniform jackets with four patch pockets. Cyril Castle made both the suit and the sports coat. 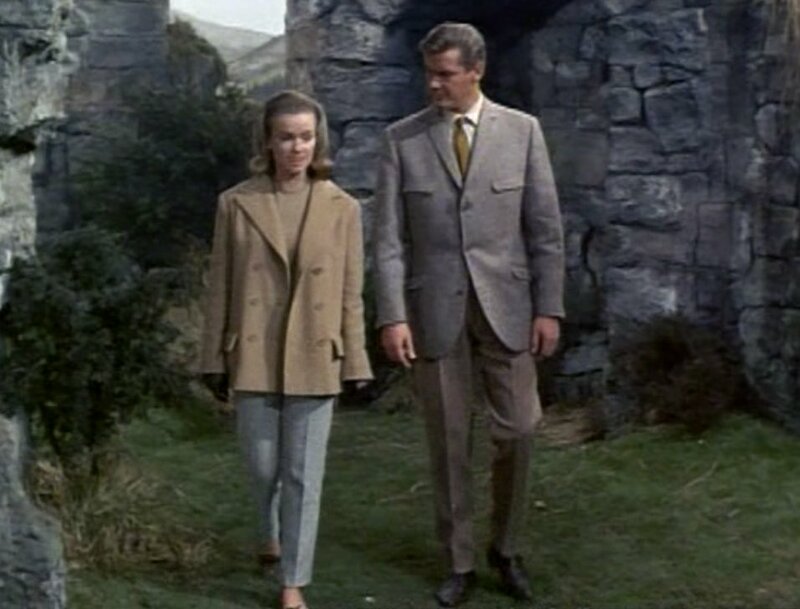 Other spies also wore jackets with set-in breast pockets. 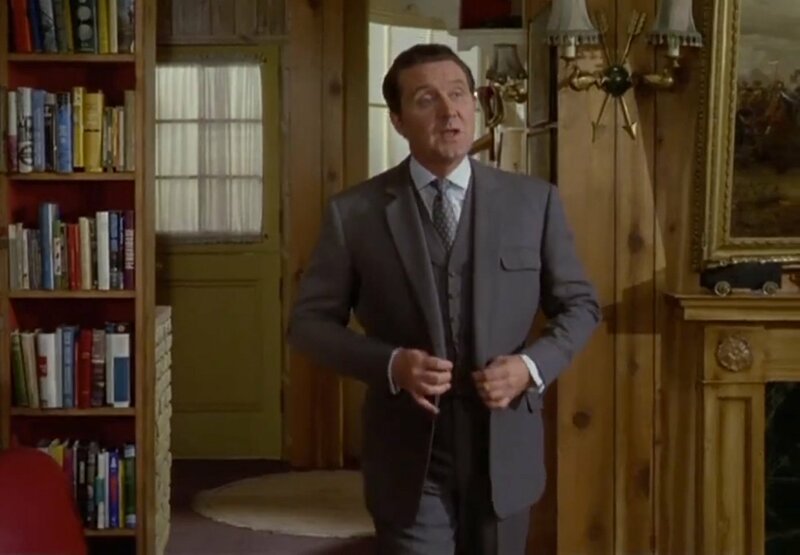 John Steed of The Avengers, played by Patrick Macnee, and Maxwell Smart of Get Smart, also had penchants for flapped breast pockets in the mid 1960s. There is one unfortunate downside to flapped breast pockets: you can’t wear a pocket square! However, the flap could be tucked in and the pocket would turned into a jetted pocket. On the other hand, a jetted pocket on the chest has an awkward look if the other pockets also have flaps, and it lacks the presence of a traditional welt pocket. Perfect detail for a cover or cavalry twill suit! Excellent post, Matt. I don’t know where you get your inspiration from! I agree, this is an interesting sporty feature which makes even the 3 piece “Saint” suit a touch less formal. It’s something which would’ve worked well on the suit you posted about a little while back from “That Lucky Touch”. I agree that the feature wouldn’t work so well on a City suit though I suppose Steeds suits were City suits of a type at least. Ideally, it works best on the kind of materials which you mention rather than a worsted, flannel or serge. As well as the examples from “The Saint” which you feature, a replica of the light brown three piece suit in light blue was produced as well as a mid brown two piece and a navy DB blazer which all had this flapped pocket. Moore obviously liked it a lot as it was a feature of his wardrobe, over 2 separate tailors, for 13 years. Sean Pertwee wears a rather sharp light grey overcoat with a flapped breast pocket as Alfred the butler in the TV series Gotham. It reminds me a lot of the one Gordon Jackson’s Crowley wears in The Professionals. Gotham is a series that seems to use tailoring and clothes in a major way in fleshing out the charactor’s personalities. Agreed, they generally do a good job. Jim Gordon’s shirts tend to look a little uncomfortably snug on him, however. Not great for a police officer who gets into so many hairy situations as he does! In The Guns of Navarone, Gregory Peck wears a beautifully frayed linen suit with a flapped breast pocket. It doesn’t get much use but it stuck with me because it’s such a distinctive detail. Does anyone know who Gregory Peck’s regular tailor was ? We all know he famously used Frank Foster for shirts. Huntsman’s website says not of Gregory Peck was a client, but Stewart Granger, Paul Newman and Winston Churchill. Matt what is the typical Huntsman cut ? The typical Huntsman cut has straight shoulders, a strong chest, a suppressed waist and a flared skirt. Typically it has one button, but that’s not a necessity. Huntsman’s website does have a section on Gregory Peck, linking to the catalogue of a Peck exhibition you might find interesting. Some of those Huntsman pieces, like The Million Pound Note frock coat and The Omen raglan sleeve overcoat also featured in the ‘Savile Row and America’ exhibition a while ago. The Savile Row Bespoke Association has an extensive gallery from that event on their website which you might also find useful. I have a navy blazer in a similar style. How padded are the shoulders on Huntsman jackets ? They have quite a lot of padding. 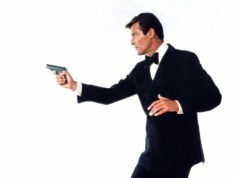 The cream linen suit Gregory Peck wore in The Guns Of The Naverone that has the flapped breast pocket was apparently made by Huntsman. I’ll have a good look in the Huntsmanwebsite thanks.